Daredevils who defied the Mighty Niagara in rubber balls and kayaks. Tragic rock slides, bridge collapses and heroic rescues. Stunning engineering feats, including the "dewatering" of the falls in 1969. More than 100 true-to-life tales are vividly recounted. Local historian Paul Gromosiak explores the region's rich history and magnetism. He creates a literary tapestry comprised of enlightening anecdotes which highlight momentous events from the end of the Ice Age to the most recent daredevil feats. 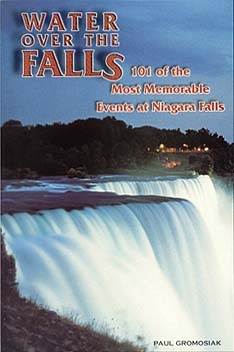 Water Over the Falls includes dozens of photographs, maps and charts which give readers a perspective of landmark events. The book will be a welcome companion for tourists, armchair historians and educators.